Modular kitchens make a strong headway in the Indian market as consumers look for kitchens that fit their needs. Gone are the days when kitchens were a not-so-important part of a household construction with semi-standard products and design. Now every home, especially in the metros and tier-I cities, wants to have kitchens that look good, are functional, convenient and also go well with the décor of the whole house. The increasing number of nuclear families, rising disposable incomes, affordability and easy budget are driving awareness levels and demand for modular kitchens. According to a report by RNCOS, ‘Indian Housing Sector Analysis,’ modular kitchens are rapidly becoming integral part of the Indian residential market. The rapidly growing residential complexes, changing lifestyle, and Western influence have stimulated the demand for modular kitchen across the country. Besides, the companies are also offering lucrative price range for both value conscious and luxury seekers, inducing high demand for modular kitchens. The awareness is growing among consumers and this can be attributed to people travelling across the globe and being exposed to the living ways people follow. “The Indian consumers now know the concept of modular kitchens; it’s still more driven by reading about it somewhere or by seeing it at someone’s place. We try and make them understand what exactly goes into a modular kitchen," adds Abhineet Seth, Head-Home Business (NCR), Home Town. The modular kitchen providers have been ensuring designs and products according to the need of the consumers and also the best in technology. Though driven majorly by international that too European players, the home grown brands are now growing at a strong level. “The international brands bring in the best of technology and designs but what limits their growth is the fact that they import their kitchens as it is without understanding the need of the Indian market,” says Namit Bajoria, Director, Kutchina. Moreover, Indian players also take an upper hand in understanding consumers and offering them international standards at relatively lower price as the products are designed and manufactured in India itself. A homegrown brand offers kitchens starting from Rs 70,000 while international brands start from Rs 2 lakhs. Brands like Kutchina have taken a step ahead to make modular kitchens a household name as they take marketing and sales door to door. “A good kitchen is everyone’s need; we have a strong team of sales that goes door to door making consumers aware about modular kitchens. Moreover, we offer customised solutions to our consumers,” adds Bajoria. Kutchina, which has almost 1800 dealers across the country, is planning to grow strong in north India and plans to open up 10 experience centres in Delhi/NCR, Punjab and Haryana regions. “We promote our modular kitchens as a necessity. We feel that every woman needs an organised kitchen and having a good kitchen is her birthright, and we ensure providing the same to our customers. Regarding business enquiries, most of them are generated through word-of-mouth," says Anant Maloo, Chairman & MD of Timbor Home Ltd.
For international brands, now is the need to create stronger brand loyalty by moving into untapped cities, offering solutions that fit their needs and pockets. Talking about penetration into other cities, Deepika Jindal, MD of Arttd’inox adds, “There is a lot of potential in tier-I and tier-II markets. Consumers are well travelled, have financial potential, and aspiring for the best in the world for their family and home, and therefore these cities are high potential markets." Arttd’inox, which has recently ventured into the modular kitchen segment, is currently present in top five metros of the country. By this year end, it plans to double the count to 10 outlets. Modular kitchens are still more of an institutional selling along with retail. 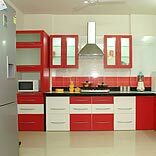 But the challenge in modular kitchen lies in making customised one of its kind kitchens. Moreover, in times, when reaching consumers, retail will emerge as the better mode of creating brand loyalty. Presently, the industry and brands are in a situation where they are looking for numbers, but once created a strong base, brands will move to the retail mode serving individual consumers. With this the need of having experience centres will grow along with dealerships. How Retail Malls Are Gearing Up To Compete against E-commerce?